AiLab are the proud founders, organisers and sponsor of the Adelaide Artificial Intelligence (AAI) Meetup that launched on the 23rd August 2018. AAI is a series of free events for anyone who has an interest in Artificial Intelligence (AI) and wants to learn more about the exciting field of AI. It is an opportunity for individuals to join a community where like-minded people can discover, discuss, network and promote the latest in AI in a fun and friendly format. We are passionate about AI and our goal is to build a diverse, inclusive and informed AI community. Using our networks, we are actively encouraging and growing the Adelaide AI community that includes developers, startups, industry leaders, academia and government. 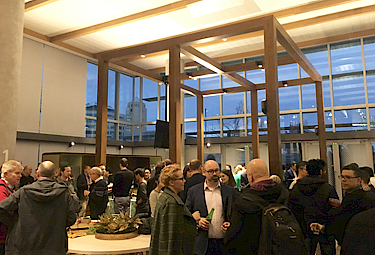 With 500+ Adelaide AI Meetup members, 100+ people attending our launch night in August and sold out events with 100+ people in October and November, we are excited to be part of helping build awareness about AI and to assist with supporting the AI community. Whether you’re a professional, a developer, an enthusiast, or just plain interested, please come along and spread the word! Drinks and nibbles are provided too! Please visit Adelaide Artificial Intelligence meetup to join the community! We are thrilled that the University of Adelaide: Australian Institute of Machine (AIML) joined us as a sponsor for 2018 events. Huge thanks to the AIML for supporting the Adelaide AI meetup. The support from sponsors enables us to produce and deliver great events for the AI community. If you would like to join us in sponsoring the Adelaide AI Meetup, please get in touch. 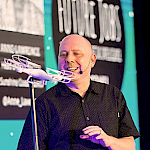 If you would be interested in volunteering to help or would like to speak at one of our events to share you knowledge and experience in AI via your business, study, research, teaching or career path, please contact us.